2016 June 2 Steve Nguyen, Ph.D. NOTE: I am reviewing this I/O psychology textbook from a reader’s perspective (i.e., the student’s/learner’s point of view) and not from an instructor’s perspective. From the very first few pages, I could tell that Psychology and Work is a refreshingly different I/O psychology textbook. I was immediately drawn to the highly readable and clear writing styles of the three authors. The book reads as though I were sitting and listening to them present in a classroom. In the preface, the authors wrote that they “set out to create a book that would reflect [their] enthusiasm for the field as well as [their] love of both teaching and researching the many important issues involved in I/O psychology” (Truxillo, Bauer, & Erdogan, 2016). I believe they succeeded in doing just that and more. For starters, let’s take the introduction to and history of I/O psychology — which is typically quite boring and dry when presented in other I/O psychology textbooks. 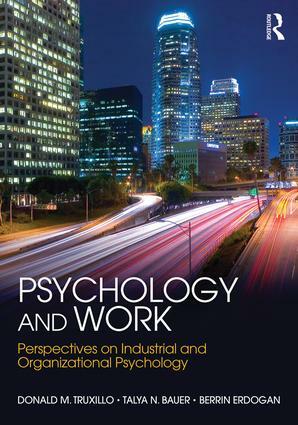 In the Psychology and Work text, the authors walked the readers through the two major areas of I/O psychology (namely, industrial psychology and organizational psychology). Truxillo, Bauer, and Erdogan (2016) explained that “Industrial psychology and organizational psychology merged many decades ago, such that there is no longer a separate ‘industrial’ or ‘organizational’ psychology. This is because a dichotomy between the two areas is neither accurate nor useful. Both are concerned with the psychology of work, and any separation of the two is a bit artificial. But more importantly, concepts from both industrial and organizational psychology inform one another” (p. 5). I love that! What an explanation to ensure that students don’t confuse or continue to wonder about the distinction between the two areas of I/O psychology. “Change management is a specialization within I/O psychology that is referred to as Organization Development (OD)” (Truxillo, Bauer, & Erdogan, 2016, p. 526). Although I applaud the authors for connecting change management to I/O psychology, I disagree with them that change management is referred to as organization development (OD). Organization development (OD) is sometimes incorrectly used to also mean change management (Cummings & Worley, 2009). However, organization development is a subspecialty in industrial and organizational (I/O) psychology (Muchinsky, 2006; SIOP, 2016). Change management actually belongs under the domain of organization development (Cummings & Worley, 2009). Thus, it would have been more accurate to say that organization development (OD) is a specialization within I/O psychology and within OD is an area called change management. For more, read my article on the link between Industrial/Organizational (I/O) Psychology, Organization Development (OD), and Change Management. “Planning, implementing, and monitoring change is a place where I/O psychologists can add value to organizations” (Truxillo, Bauer, & Erdogan, 2016, p. 526). “In the news media, organizational change is often portrayed as revolutionary (as opposed to incremental) and as directly attributable to the actions of specific individuals, most notably a new CEO, or a few heroic individuals. . .In contrast, the I/O psychology literature…has generated a large body of literature describing the ingredients of successful change. What this literature suggests is that the success of a change effort is ultimately the result of how change recipients — those employees who are affected by the change — receive it. . .Given the importance of the human element in successful planning and implementation of change, I/O psychology has a lot to contribute to organizational change management” (Truxillo, Bauer, & Erdogan, 2016, pp. 545-546). Another area I appreciated was Psychology and Work’s chapter (Ch. 12) on stress and occupational health psychology. Many I/O psychology textbooks either ignore or fail to cover the field of occupational health psychology, opting instead to talk about stress & worker well-being, worker stress, or stress management (the exception is Spector’s Industrial and Organizational Psychology which devotes an entire chapter to occupational health psychology). Occupational health psychology (OHP), an interdisciplinary field within I/O psychology, concerns the application of psychology to improving the quality of work life and to protecting and promoting the safety, health, and well-being of workers (Journal of Occupational Health Psychology – Description). Thus, for I/O psychology textbooks to talk only about work stress or stress management, while ignoring workplace safety, does not adequately inform students/learners about the broader field of OHP. The Psychology and Work textbook covers occupational health psychology directly and this is much appreciated. Truxillo, Bauer, and Erdogan (2016) wrote that OHP is such an important and integral part of I/O psychology (the focus in I/O psychology is, after all, on individuals at work) that no introductory textbook on I/O psychology would be complete without a chapter dedicated to occupational health psychology. I really enjoyed the chapter on Training and Development (Ch. 8) and the fantastic reference to the article by Salas, Tannenbaum, Kraiger, & Smith-Jentsch (2012). Salas and colleagues (2012) stated, “decisions about what to train, how to train, and how to implement and evaluate training should be informed by the best information science has to offer” (p. 74). The article is packed full of clear principles (informed by science) as to what matters most in the design and delivery of training. “[W]e will provide an overview of the training process, beginning with the training needs assessment, followed by a discussion of factors within the trainee and in the work context that can help — or hinder — the effectiveness of a training program. We will follow this with a discussion of specific training methods and when to use each of them, and how to evaluate whether or not a training program is working. We conclude by discussing current training issues and offering advice for how to take charge of your own training and development” (Truxillo, Bauer, & Erdogan, 2016, p. 273). Psychology and Work features a huge section/header font size, as well as key terms, highlighted in a separate color, that are easily distinguishable and in bold in the body of the page and definitions of those key terms displayed on the side of the page. There are learning goal statements at the start of each chapter to help students know what to expect. There are workplace application boxes which offer examples to illustrate key concepts. There are also case studies that highlight how the theories and concepts in I/O psychology matter to workers and the organizations that employ them. I also like the “What does this mean to you?” sections at the end of each chapter showing how the material can be applied to students — those already in the workplace or about to enter the workplace. In order to truly evaluate (“size up”) the Psychology and Work textbook, I compared it to two popular I/O psychology textbooks [textbook #1 is my old I/O psychology book and textbook #2 is my “go-to” I/O psychology text]. The Psychology and Work textbook was matched against these two I/O psychology textbooks on three topics: (1) training and development; (2) adverse impact determination in employee selection; and (3) use of cognitive ability tests in personnel selection. For the topic of training and development, I/O psychology textbook #1 (my old I/O psychology textbook) was difficult and painful to read and absorb, while the Psychology and Work textbook was just effortless. Both textbooks contained the same or very similar information about training and development but the manner in which the material was presented made the choice to go with the Psychology and Work textbook an easy, obvious one. Next, I decided to compare a topic that’s one of the most well-covered in I/O psychology textbooks — adverse impact determination in employee selection. I/O psychology textbook #2 was less verbose, used less legalese, and was less confusing than I/O psychology textbook #1. Unlike I/O psychology textbook #1, which explained adverse impact determination using only text, I/O psychology textbook #2 provided a table to explain the 80 percent or 4/5 rule in determining adverse impact. This was helpful, but still not as clear as it could be. The Psychology and Work textbook, on the other hand, offered text as well as a simple equation and two examples to explain the 80 percent or 4/5 rule — one in which the employer was not in violation of the 4/5 rule, and the other in which the employer was in violation of the 4/5 rule. What’s more, to help readers understand this concept, Truxillo, Bauer, and Erdogan (2016) walked us through a 3-step adverse impact case. Simply brilliant! Step 1: The person bringing the lawsuit (plaintiff) must show/demonstrate adverse impact. The plaintiff has to establish that a selection procedure used by the organization has adverse impact against the group to which they belong (e.g., using the 4/5 rule). Step 2: Employer demonstrates test validity. If the person bringing the lawsuit (plaintiff) is able to show that adverse impact exists, the employer will now need to defend themselves. One of the most important defenses is to show the validity of the selection procedure. Step 3: The person bringing the lawsuit (plaintiff) demonstrates other predictors were available. If the employer can show that their selection procedures are valid, the plaintiff can show that other, equally valid selection procedures with lower adverse impact were available for the employer ti use. “This is a fairly high bar for most plaintiffs to reach, and thus most adverse impact cases end if the employer can show that its selection procedures are valid” (Truxillo, Bauer, & Erdogan, 2016, p. 244-245). Psychology and Work textbook – Truxillo, Bauer, and Erdogan (2016) clearly explained at the outset that tests of cognitive abilities have a long history in I/O psychology and that “general cognitive ability [also known as g] (which psychologists consider to include reasoning, symbolic representation, and problem solving) is one of the best predictors of performance across jobs” (p. 184). “The main reason that g [general cognitive ability] is such a good predictor of job performance: It allows workers to learn their job more quickly” (Truxillo, Bauer, & Erdogan, 2016, p. 184). Equally important, however, is that tests of general cognitive ability have been shown to have adverse impact on minority groups. Thus, due to legal reasons as well as fairness and diversity, employers are reluctant to use cognitive ability tests to make hiring decisions (Truxillo, Bauer, & Erdogan, 2016). I/O psychology textbook #1 (my old I/O psychology text) – I actually had quite a bit of trouble locating this piece of information using the table of contents and had to resort to the subject index. It was hidden deep inside an obscurely worded chapter, with cognitive abilities and cognitive ability tests more than 25 pages apart! What’s interesting is that there was no mention, in the section on cognitive ability tests, of general cognitive ability tests and their adverse impact on minority groups (which the other two I/O textbooks mentioned). I/O psychology textbook #2 (my “go-to” I/O psychology text) – Although the same information was covered, reading it made me feel as if I were being lectured to, rather than a professor talking with me and the class. The writing style is mechanical and dry. I can’t say enough how clear and easy-to-understand the writing is throughout Psychology and Work! I selected three topics (training and development; adverse impact determination in employee selection; use of cognitive ability tests in personnel selection), intentionally choosing a boring, but important, legal topic (adverse impact determination in employee selection) to see if the writings and clarity remained consistent all through the Psychology and Work textbook. It is and that’s an incredible achievement. I thoroughly enjoyed this book, despite my quibble about the authors’ assertion that change management is referred to as organization development. It is truly a rare treat to find a book, written by college professors, that’s this much fun and easy to read! I only wish more I/O psychology textbooks were as well designed and written as Truxillo, Bauer, and Erdogan’s Psychology and Work. It is absolutely one of the finest and most carefully crafted textbooks I have seen! Bravo! Cummings, T. G., & Worley, C. G. (2009). Organization development and change (9th ed.). Mason, OH: South-Western. Disclosure: I received Psychology and Work: Perspectives on Industrial and Organizational Psychology as a complimentary gift, but my book review was written as though I had purchased it. Previous PostThe Link Between Industrial/Organizational Psychology, Organization Development, and Change ManagementNext PostCost of Stress on the U.S. Economy Is $300 Billion? Says Who?